What is the Scarlet and Grey Team? The Scarlet and Grey Team is a recreational, instructor recommended girl’s competitive team. All girls who can demonstrate the required skills are eligible to participate. Scarlet and Grey Team members register just as they would for any other class. The Scarlet and Grey Team train 2-6 hours per week. To some extent you choose how often and how much you want to train. 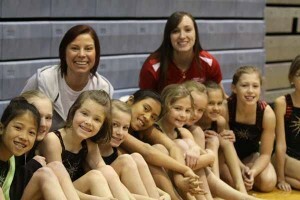 The girls compete within Buckeye Gymnastics and with other local teams in the Central Ohio area. Buckeye Gymnastics is a member of the Greater Columbus Gymnastics Conference and compete with other teams in the Central Ohio. Buckeye Gymnastics Scarlet and Grey team competes at the Xcel level. Please register for Scarlet and Grey Team just like you have always done for classes at Buckeye Gymnastics. Scarlet and Grey is offered at both the Westerville and Powell locations. You must be recommended via your Buckeye Gymnastics coach or register for a skill evaluation by calling 614.895.1611 Westerville or 614.793.1936 Powell. What do the girls compete? Gymnastics is not an easy sport. It takes some training to compete at even a beginner level. The girls will train and compete on vaulting, uneven bars, balance beam and floor exercise. The sport of gymnastics is governed by USA Gymnastics (USAG). The Scarlet and Grey girls will learn routines that are composed of skills using the USAG Xcel Rules and Regulations (Silver, Gold, Platinum and Diamond) and USAG Xcel Event Rules. The Scarlet and Grey Team will have the opportunity to compete 7-8 times during the year with all of the competitions held in greater Central Ohio. The girls are not required to compete, but are encouraged to participate in the “competitive aspect” of Scarlet and Grey. Nor are they required to compete on every event. But if they do decide to take part in a competition they must be currently enrolled in the gym and be current with all fees and tuition. Competition begins in the fall and will continue through spring. We begin with an intra-squad competition and progress to out of house competitions. We compete with other gyms in the Central Ohio area that offer this type of program in a League format that culminates with a Greater Columbus Gymnastics Conference Championship meet. The focus of the Scarlet and Grey program is on fun. However, we will always keep in mind that the fun of gymnastics lies in the ability to perform ever more difficult gymnastics skills. To that end we will train hard enough to develop the strength, flexibility, and skills necessary to do the gymnastics routines safely and correctly. We will insist on proper form and technique and will expect the girls to try their best. Should the girls ever want to compete on our USA Gymnastics (select) team or on their middle school or high school teams, the Scarlet and Grey Team will lay a solid foundation for doing so. The Scarlet and Grey girls have an option to compete in a selected Buckeye leotard. You may choose to purchase the Scarlet and Grey Buckeye leotard, wear the Buckeye leotard from the previous years or choose to wear your own leotard. Additional fees are required for competitions. Complete details are available in the offices at both Westerville and Powell.